...all of which make the probability of them choosing your company to buy when the time comes more likely. According to a DemandGen Report, “67% of B2B marketers say they see at least a 10% increase in sales opportunities through lead nurturing, with 15% seeing opportunities increase by 30% or more.” Lead nurturing keeps you in the minds of those leads who are not ready to buy just quite yet—a major advantage. This is especially important because B2B SaaS purchases are less transactional than B2C; and nurturing keeps you top of mind. 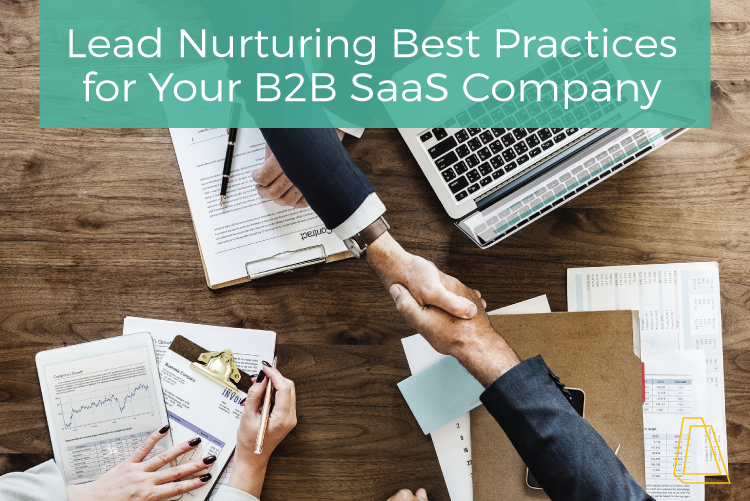 With that, we’ve put together some lead nurturing best practices for you to use at your B2B SaaS company! While adding a prospect’s name to an email and/or subject line is helpful (nobody likes the impersonal “Hello,” in a marketing email), personalization should go beyond this basic step. Think of lead nurturing like building a relationship. Every conversation or interaction you have should teach you something new about the person, things like demographics and levels of engagement (the utilization of a CRM system can drastically improve your ability to directly target your ideal buyer). You can even gather your own data on customers with surveys within your emails, allowing them to choose what kind of communication they prefer (helping you send them the right kind of content). You should also consider each lead’s buyer persona so you can send more targeted information. When you understand who your buyers are, your message gets more tailored and targeted. The result? Your email feel personalized to them. Along the lines of personalization, your leads approach each stage of the buying process at different times and in slightly different ways. While it’s a good practice to implement some kind of predictive model using your buyer personas, knowing your leads through data allows you to communicate effectively with them. Whether that’s by engaging them through different platforms or presenting them with different types of content, the preferences of your leads matter. If emails aren’t showing the metrics you were hoping for (low open or click-through rates) make tweaks to your messaging and test, test, test. Your leads’ preferences may also change as your relationship continues to develop, so make sure your lead nurturing tactics don’t go stale! As you get to know prospects better through the data you collect, you will become more adept at adjusting your message to resonate better, and always making sure you’re addressing their needs as potential buyers. As with every decision made in regards to your business, you should take into consideration a cost-benefit analysis. How high is the likelihood is that a lead will evolve into a final sale, and how profitable is that sale are important factors to take into consideration when developing your lead nurturing program. A lead nurturing software investment can be a large one, so you want to make sure your leads are going to make that investment worthwhile. Don’t make that leap right away, especially without solid research into your audience, so you know exactly what you need your software to do for you! Check out the expected ROI of your leads to choose how much time and money investment you need to put into converting them into eventual buyers. Try segmenting the leads you identify as possible buyers into the likelihood of a final sale. For example, those with a highest probability of purchase should be treated differently than those who are known for tire kicking. You should always start with a definition of your ideal lead—do they need to be from a certain company size? Only within the U.S.? Again, your data is your biggest asset for making these decisions. Finally, use your lead nurturing program to match the development of the sales cycle to the buying cycle. In each stage, if movement through the cycles has stalled, utilizing your lead nurturing program will help guide leads through! If you’re looking for more information on lead nurturing best practices, check out our B2B Lead Nurturing Workflow Checklist to get you started building your own program!